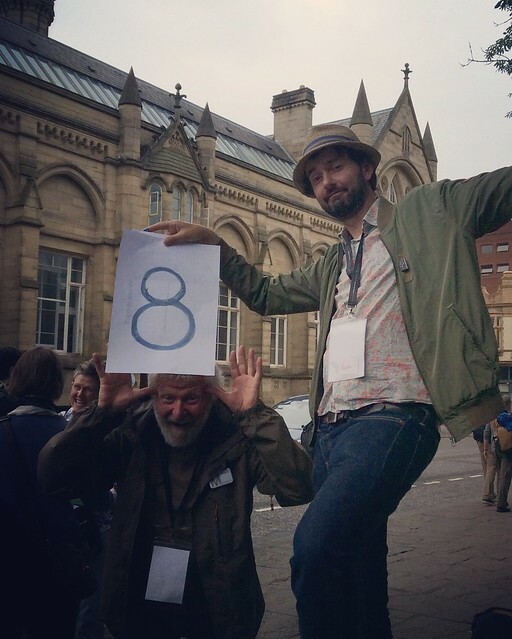 The 7th International Urban Sketching Symposium kicked off on the Wednesday evening with a big gathering at Manchester Town Hall in a huge, wonderful room that was not unlike the Great Hall at Hogwarts, but more ornate and elaborate. 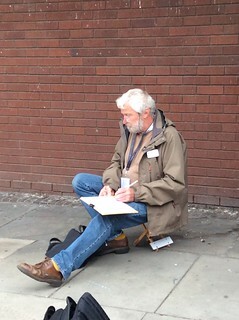 I didn’t however take any photos or do any sketching, busy as I was meeting with old friends and chatting away. I did got for dinner afterwards and sketched there but I will post all the ‘dinnertime’ sketches separately I think. 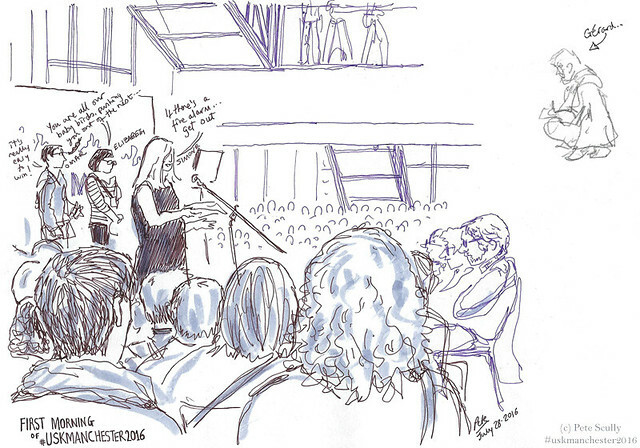 I’d like now to dive into the Symposium itself – above is a quick sketch I did of the first morning introduction session, with Simone Ridyard, Elizabeth Alley and Omar Jaramillo there. It was time to go and sketch, and my first workshop was one I was really looking forward to: “Cars in the City“, with Lapin and Gerard Michel. Yes indeed. 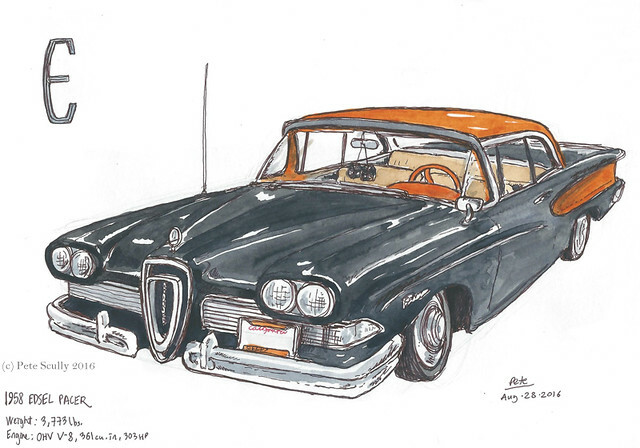 I’ve known Lapin and Gerard since the first Symposium (though have followed their work since the start of Urban Sketchers), both have very different approaches but have a big love of drawing cars, especially classic vehicles. 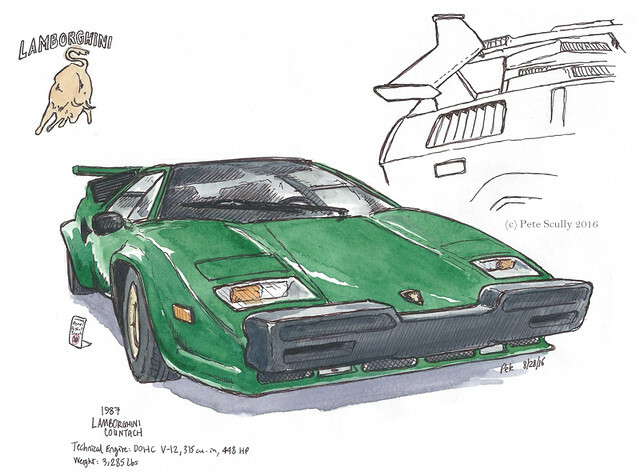 This workshop of course was originally to be co-taught with Florian Afflerbach, the great sketcher of cars who sadly passed away earlier this year. I took a workshop Gerard and Florian co-taught in Lisbon, teaching me a lot about perspective. While this workshop was not necessarily about large scenes and mastering vanishing points, the workshop did focus very much on how the eye perceives the world based on our distance from what we are sketching, and Lapin and Gerard did a good job of showing us what they mean. 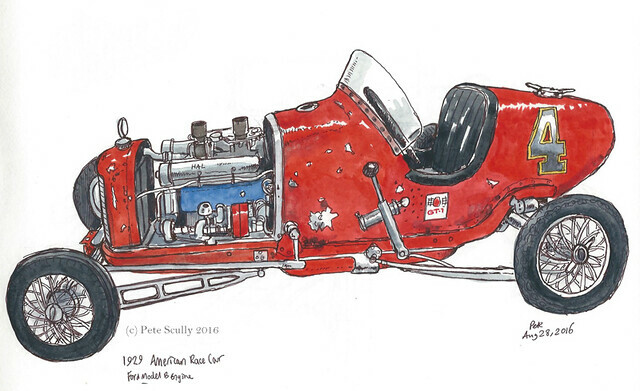 Our first assignment was to sketch a car from a distance of about a metre or so, maybe a little more. The view of the car would be more typical, and they gave us an example of how to work out the shape using simple boxes. 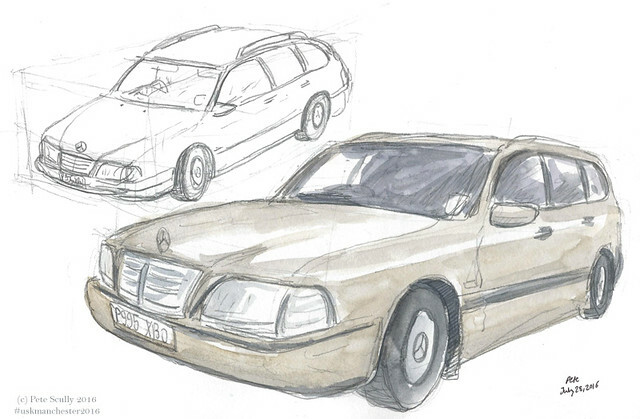 My first car happened to be a Mercedes, and I drew in pencil (thinking again of Florian), keeping a little way back from the car, crouched, as it looked very much like it might rain. Oh and by the way it certainly did rain. 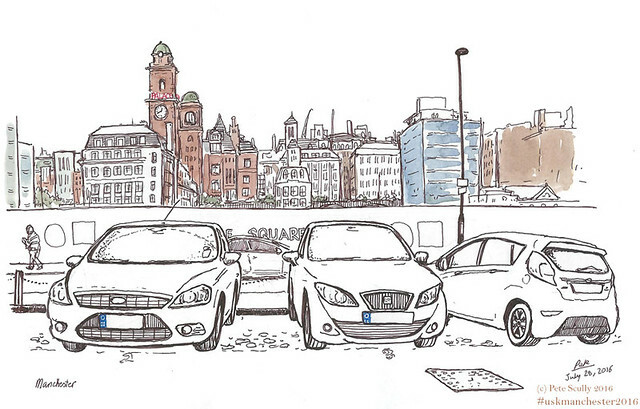 So we found a car-park not too far away which was sheltered beneath an overpass, and sketched in there. Lapin asked us to sit very close to the car we wanted to sketch – the closer you sit, the more warped the perspective would start to look. This is a good rule for perspective – you position matters enormously, and even slight changes to your position can alter the perspective of what you are drawing immensely. 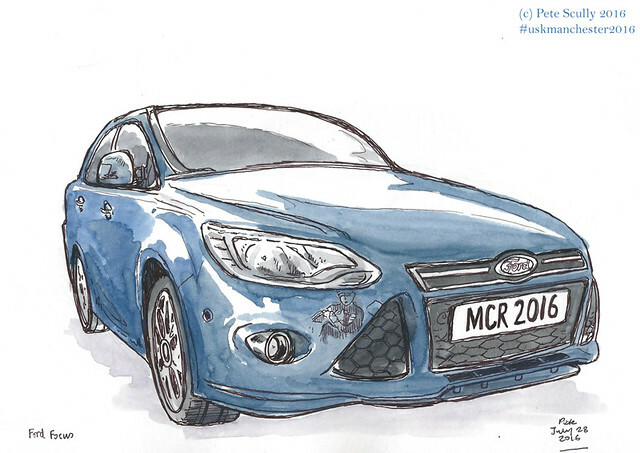 I found a blue Ford Focus – hardly a beautiful car but still attractive for the sketch’s purpose. 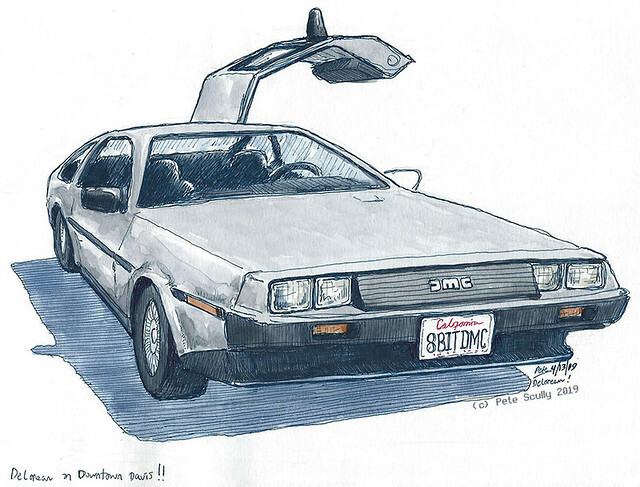 I drew my reflection in it and also changed the number plate to something more fitting the Symposium. Lapin came and said, sit even closer! I was pretty close, but still two feet or so out – he suggested going right up to the car, and seeing what happened. His suggestion to the class was that we don’t think about perspective rules, rather, just see what is in front of you as a series of shapes, and draw the shapes, letting the picture unfold itself. 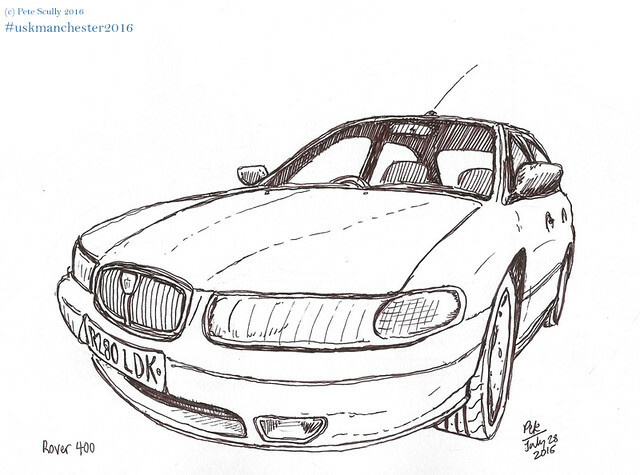 For my next car then I chose a Rover 400 (below), a more classic British brand, and sat right up to the headlight. Well I think you can see the difference! Immediately everything bends that bit more, yet the sketch really starts to pop out. This is something I would like to try a bit more. We ran out of time before I could add colour, and we had a little gathering to discuss what we had learned, but the parking attendant in charge of the car-park came along and booted us out; I guess the car park is private property, but it was good shelter from the rain. 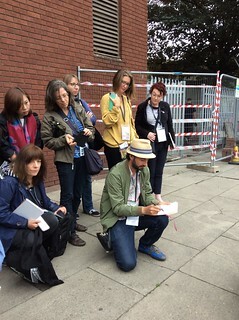 We moved along to a spot around the corner for the final part of the workshop, drawing cars with the city around them. This was very much Gerard’s part of the class and he showed us some examples; including the cars in the foreground of the sketches helped to add depth but also some foreground anchor to help understand the perspective of the scene. there was a nice spot away from the rain next to an office block, showing a clear view of Manchester’s skyline (thanks to a building having been demolished, I believe it was something to do with the BBC). We did go into the building and ask permission to sit beneath it and sketch, and they were fine with it. It was a very interesting view, with the Palace Hotel there, but oh so rainy. Many thanks to Lapin and to Gerard! Awesome instructors! 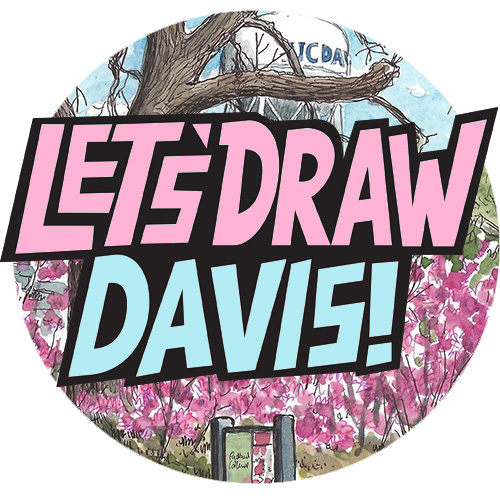 I walked around downtown in Davis yesterday looking for a car to sketch in tribute to Florian Afflerbach – Flaf – who passed away recently, far too young, far too soon. 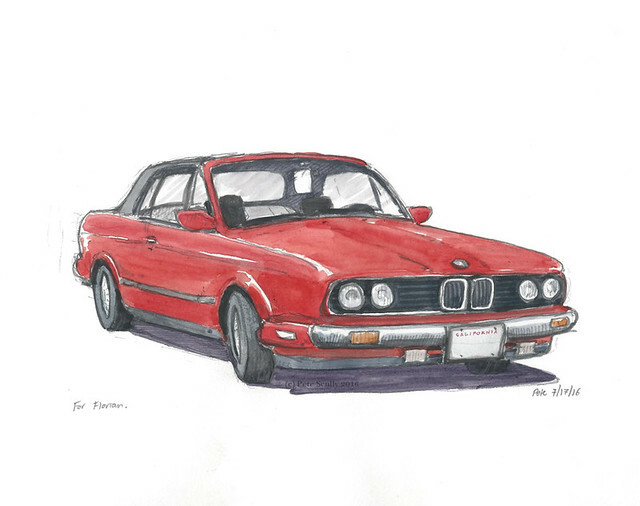 I could have drawn any of the scores of beige Toyotas or silver Hondas parked along the street – it was Florian who taught me to see the beauty in the form of a car, or a modern building – but I saw this red BMW parked along 2nd Street, and immediately I thought of the BMWs Florian, himself from southern Germany, had drawn. I sketched in pencil and watercolour, with Florian in mind. I felt pretty sad though, remembering Florian; in the spread about drawing cars in my book Creative Sketching Workshop, I mentioned Florian as one of my main inspirations. 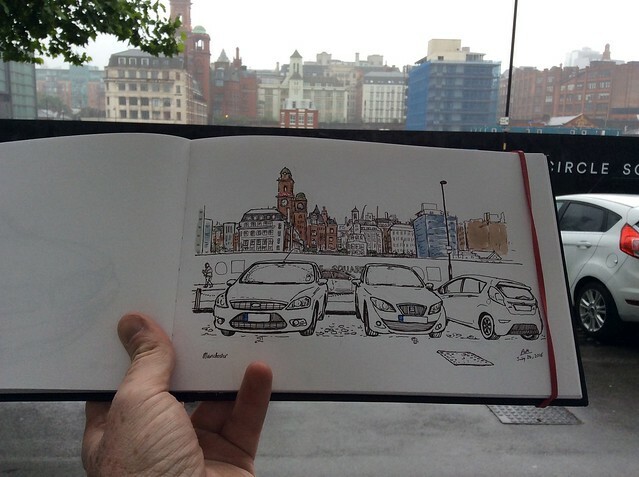 I think it’s hard to sketch cars and not think about him.That’s a feeling that will be shared by many at this year’s Urban Sketching Symposium in Manchester. 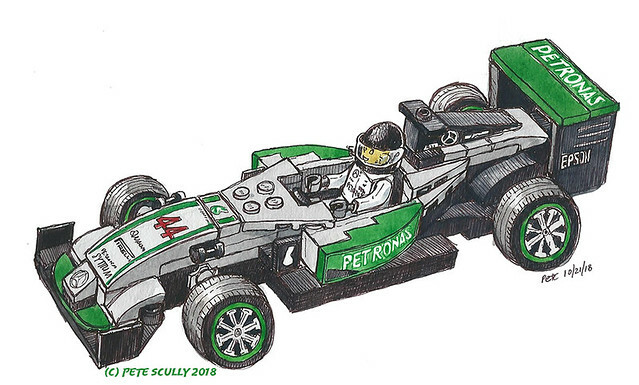 The participants in this year’s symposium were asked to draw a car as a tribute to Florian, and this one is mine. I sketched this on Stillman and Birn ‘Alpha’ paper, in pencil and watercolour rather than my usual pen; I think Florian would have been proud of me. Still can’t believe he is gone. Here are a couple from my second visit to the monthly meet-up of local classic automobile enthusiasts in the parking lot of a shopping mall a couple of blocks from where I live in north Davis. This was the last meet of the year, and I managed to get there with enough daylight left to sketch more than one car this time. 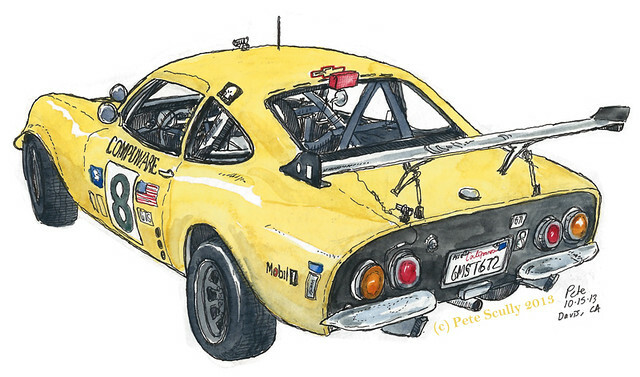 The yellow car on top is an actual racecar, which races locally for Team Tinyvette (they have a Facebook page) and races in something called 24 Hours of LeMons (this is a vehicular urban sketchers dream if ever there was). I understand the pun ‘LeMons’ because my son’s a big fan of Cars 2. Anyway the driver of this car is called Mike. 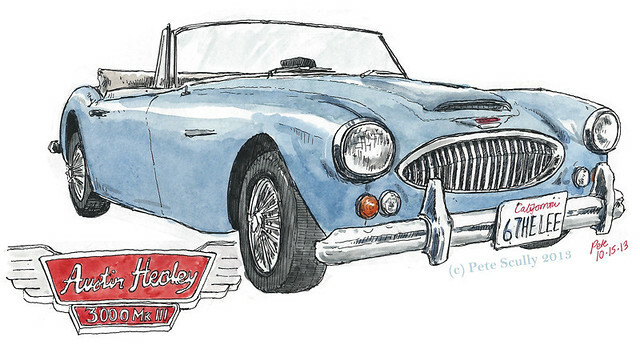 This beauty is an Austin Healey. The owner was very happy to find out that I was British, and talked about the history of Austin Healey and how the guy who made them refused the make any more after the powers that were decided in the 70s to make several safety features (such as shoulder seatbelts) mandatory. I don’t know much about any of that but this is a gorgeous car, classic old British style. The other evening, after dinner, I cycled down to the Marketplace parking lot in north Davis (that cultural hotbed) where there was a meeting of classic automobile enthusiasts. By that I mean that the automobiles were classic, not that the enthusiasts were classic, though they probably were, I don’t know about how to judge an enthusiast’s classic status. The ones I met were very nice. Anyway the sun was already going down and so I didn’t have a great deal of time to choose a car to sketch, but this beauty stood out above all the others. Now some of the cars were spectacular beasts, and some were, to be fair, verging on the old banger. This fine automobile however was bright and shiny and oozing in fifties Americana. Its yellow trimmings reminded me of California sunshine (that, and the fact I was in California and it was sunny, for a few more minutes anyway). 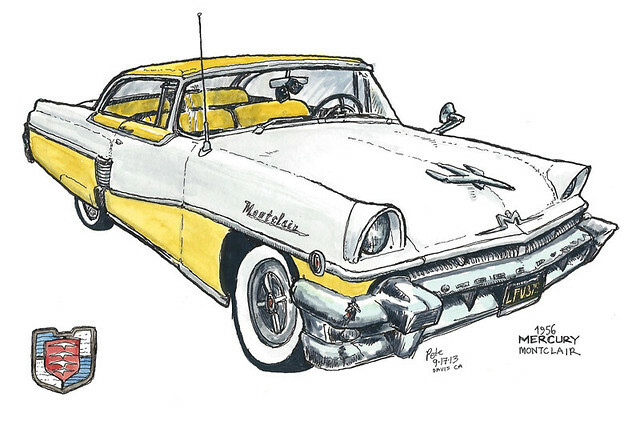 So I sketched it, and you can see my reflection in it, and the owner liked it; it was his first car, in his family since 1977, and it is a 1956 Mercury Montclair. 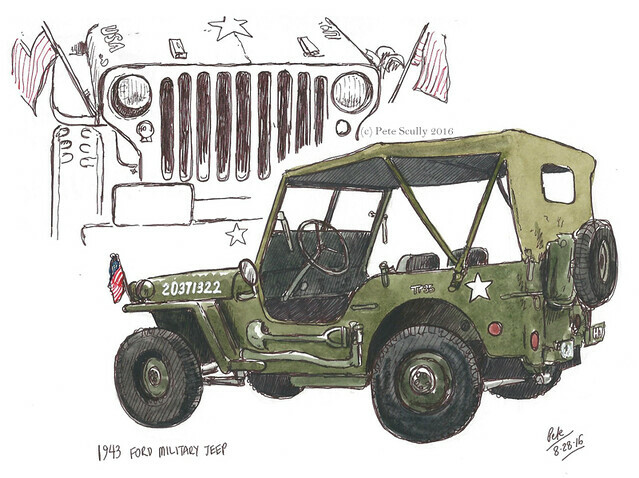 Now this says ‘America’ to me, not your beige Toyotas. Three people sat in the front, like in the movies, cruisin’ low and slow, all of that. 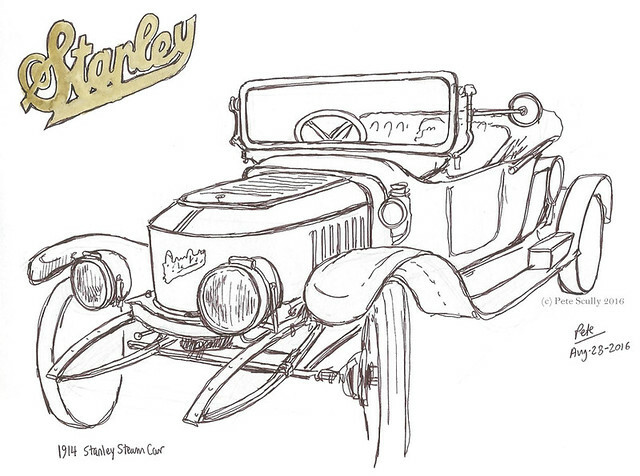 I do like to sketch a classic automobile. They’re having one more this year, next month, same place. I might get there earlier this time, and sketch some more.